The subtitle says it all. This is a story of a marriage rather than a biopic, so do not expect to find out more about Stephen Hawking, or his triumphant breakthroughs in Physics. Instead, this story focused on the relationship between these two extraordinary individuals; both of which were brought to life by the award-worthy Felicity Jones and Eddie Redmayne. Writer Anthony McCarten based his script on Jane Hawking's memoirs, so it is not surprising that we focused more on Jane and her relationship with Stephen, rather than Stephen himself per se. In addition, the Science was barely explained, nor how Stephen came about his theories; luckily, the observation of a marriage as unique as theirs was written much better, although it could have been explored a lot better especially since the timeline of the show spanned nearly 25 years. Thankfully, there were a few moments of genuine, heartfelt tenderness and silly, English humour. The Doctor Who jokes were great, and truly something I felt Stephen Hawking would understand. Director James Marsh directed this film with a steady and polished hand, however, as the film progressed, there is a palpable sense that Marsh seemed to be losing steam in his storytelling. The first act was brilliant. It was filled with a myriad of emotions: joy, first love, bad news, despair, true love, discovery, etc. But as we approached the realisation that this was going to be an examination of a marriage, the pacing faltered and at times dragged. This is of course not due to any fault of the two stars. Both gave riveting, awards-worthy performances. Redmayne definitely had the more showy role, and he did it with aplomb. He managed to capture the mischievous wit and unbridled genius of Stephen Hawking in his mannerisms and speech, and later on, through his expressive eyes. It takes dedication to transform oneself like what Redmayne had done. However, credit must also be given to the costume and makeup team. The one thing lacking in his performance is actually the passion within the man. Both in terms of towards his work and towards Jane Hawkings (and their children). Oddly, he had more chemistry with his second wife as played by Maxine Peake. It will be inevitable that Redmayne's performance will be compared to a fellow young Brit: Benedict Cumberbatch's portrayal of Alan Turing in The Imitation Game. Cumberbatch's performance was more fine and nuanced, with some great and weighty emotional scenes; Redmayne's was, as aforementioned, more showy and dedicated, but ironically, lacked the showy emotional dramatics that helped to show range. Nonetheless, both actors definitely gave the best performances of their young career, thus far. Felicity Jones, on the other hand, had a more subdued character as the loving and long-suffering wife. Jones was really the heart of the film, and not surprising, since it was actually based on her memoir. We really do get a better understanding of Jane rather than Stephen in the 123 minutes, and this is testament to Jones' performance. Her English stoic-ness revealed few cracks, but when those cracks appear, she shone through the bleakness of the washed-out palette. The score by Jóhann Jóhannsson was befitting to the film and a few key moments stood out, but otherwise, most of it was rather background. 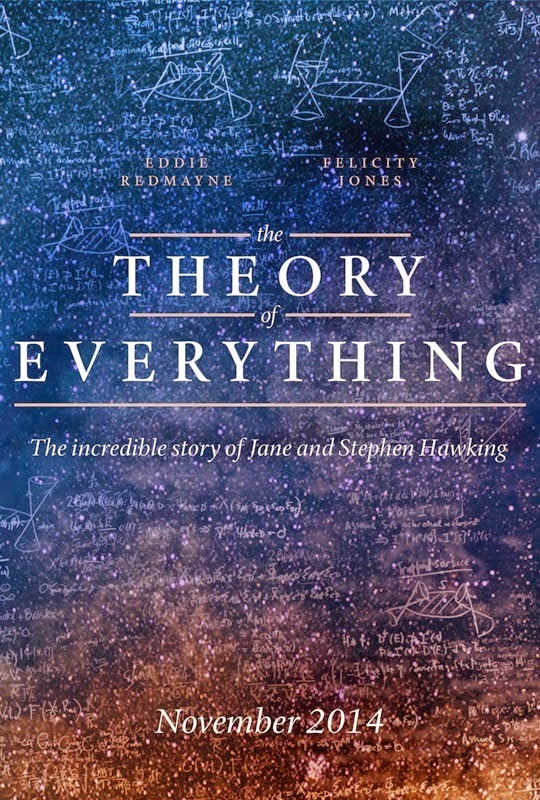 There was a moment in the movie where the economic truths of a Professor with 3 children and suffering from ALS is brought home, and one cannot help but wonder if that was the case for Stephen Hawking approving this film.